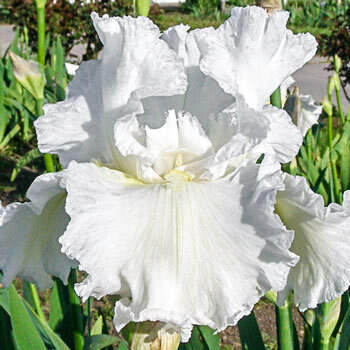 Frequent Flyer Reblooming Bearded Iris | Michigan Bulb Co. Planting Instructions: Set rhizome so bottom half is below ground level. Firm well and water thoroughly. Plant where they will get at least 5 hours of sun per day. Soil Requirements: Well drained soil is important. Vigorous grower which requires generous feeding if soil is not fertile. At least 5 hours of sunlight each day. Water during dry periods. Avoid water-logged soils. Pruning: Cut off dead blooms. Cut back foliage to fan size in late fall. Clean up plant debris before winter to prevent borers from overwintering. Winter Care: Mulch in colder climates and remove in early spring before growth starts. 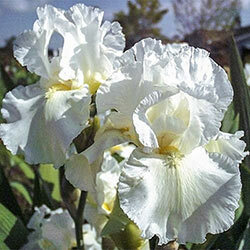 Additional Information: Performs best in full sun, but will bloom well in part shade. Plant in full sun except in extremely hot climates like Arizona. If soil is heavy or clay-like, add rice hulls or similar to improve and aid in drainage.